Couldn’t agree anymore that this is one fxxking brilliant execution! Good work here by Graubünden tourism. I mentioned before a number of times the importance of having an engaging platform to communicate your message and this is clearly another example of how unique stunts can be effectively pulled off. Imagine a talking billboard that corresponds with you LIVE and actually invites you on a trip! Through the use of an interactive screen, Graubünden tourism was able to capture the attention of the public. By having a man in the mountains, they load up a real time camera and had him interact with the public. He invites them to a challenge and the person with the best yodel gets a free ticket to the mountains. Truly amazing. Always a big fan of outdoor activations, I enjoyed seeing how powerful ideas turn to life together with the amount of joy and laughter it elicits from people. What we have here is an interesting mirror that actually talks to people who passes by. Originated from Brazil, bread brand Nutrella created the ‘friendly mirror’ which aims to make your day by singing praises and talking. Creepy, some might say, but the tonality has simply made it a rather amusing experience. I realise i do have a liking for billboard advertising, especially those that bring out the intended messaging through very creative means. Take domestic violence for example, I have seen tons of them done in a very statistical manner, direct and not interesting at all. You don’t grab a person’s attention, you don’t get to communicate anything at all. 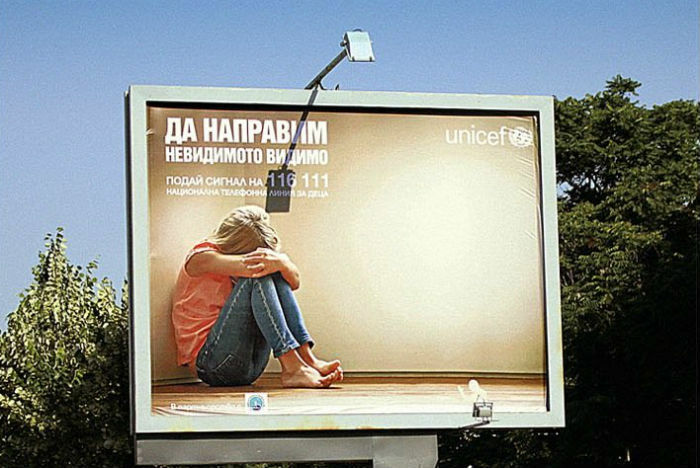 UNICEF’s recent billboard shows transitions between the day and the night. Just like violence at home, it usually happens during the night. Interestingly, this level of relevance is imperative in getting the right attention at the right time. It is reported that there are close to three million cases in the United States where children are abused badly. 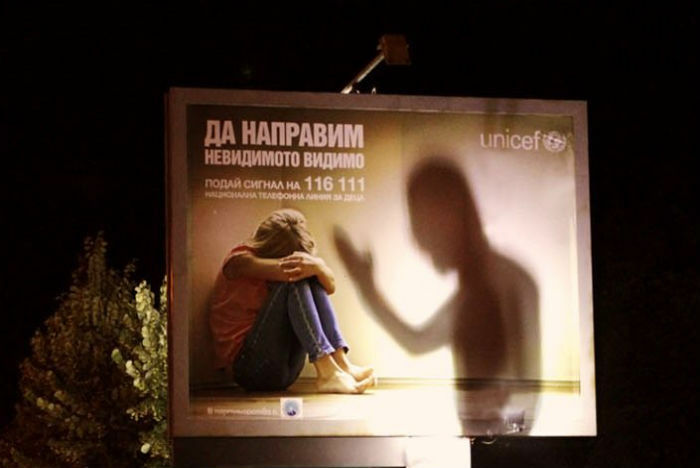 These ads brings awareness to people about violence at home, in the night where it goes pitch dark, it brilliantly casts a shadow of a horrifying figure attempting to strike the little kid. Interesting execution. For a start, this might seem lame to certain people. However, the idea of interactivity and engaging consumers is clear in this execution. Mc Donald’s ‘Save the Sundae’ campaign came as a brilliant idea that addresses to the brand’s eagerness to engage their followers. Good job from the boys from Leo Burnett.